LIKE ALL ORGANISMS, HUMAN BEINGS INTUITIVELY understand the process of organic growth. Cells develop and multiply, enlarging living things logically to fulfill their genetic profile. Animals and plants adapt to—and interact with—their surroundings. But when it comes to habitat, humans tend to discount the fit between their biological selves and the buildings they occupy. They expand and change houses according to rules much different than those that govern the natural world. Unlike hermit crabs, Homo sapiens tend to assume that they are stuck with “shells” that they have outgrown. Preservation architects deal with change in virtually every project. Designing additions or renovations to historic houses demands knowledge of both architectural history and general principles of formal transformation. Most preservationists are aware of these principles, but for reasons that are explained below, few homeowners follow them when considering an addition or renovation. A well intentioned but ill-informed homeowner, builder, or architect can wreak havoc with the proportions, scale, massing, and detail of a historic house merely by ignoring its intrinsic formal logic. Like introducing cancer cells into a healthy organism, bad remodeling causes irreparable damage. Life-cycle alterations in the built environment are much akin to the sequence of creation, growth, decay, and rebirth in nature. Finding a logical pattern behind building growth is a bit like discovering the changing forms of plants and animals. 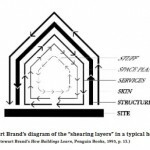 The biologist and inventor Stewart Brand has demonstrated this in How Buildings Learn. He traces the kinds of transformation that occur when buildings are reused, expanded, or otherwise changed to fit the requirements of new technologies or users. He begins his analysis with a simple diagram.1 Using an analogy to plant morphology, this diagram illustrates the layers in a typical building as concentric rings that start with the occupants and their “stuff.” The elements that are closest to our bodies, like furniture, bedding, and appliances, are also the most transportable—hence the French word meubles. Witold Rybczynski discusses the origins of modern comfort in his book Home: A Short History of an Idea. He notes that only after the increased security that followed the Middle Ages were castles and manor houses equipped with furnishings that stayed with the house. Prior to that time everything required for a domicile was transported from fortified keep to fortified keep.2 The ancient origins of our words explain the most salient aspect of our stuff—that we are apt to move it, replace it, or change it often. Paradoxically, when modern architects like Frank Lloyd Wright began designing built-ins in most rooms, he was making them less adaptable. 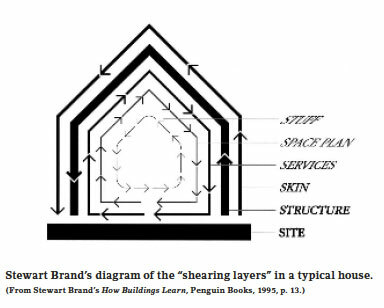 Brand’s second layer, though not literally one, is the spatial arrangement of the building that we call a plan. What the French call the disposition of functions in our homes is peculiar to cultures, families, and individuals, but it also changes when needs or standards for space use evolve over time. Some requirements in a plan are dictated by adjacencies between functions—kitchens and dining areas are best when close together. Others are the result of social norms, such as the double parlor found in many Victorian houses. No longer relevant today, in the nineteenth century these rooms were needed for formal visits. The front parlor or reception room was off the hall, serving a necessary purpose as the place where a guest waited to be seen by a member of the family. The more intimate rear parlor was reserved for family gatherings or visits by good friends. Today the living room is waning in popularity, just as formal parlors did one hundred years ago—families prefer to hang out in less formal spaces near the kitchen. A combined kitchen–dining–family entertainment room is now an essential requirement in a new house, and sometimes must be added to an older one. We mentioned earlier that every fifty years or so a house will need an upgrade in its services—meaning the mechanical, electrical, and plumbing systems. Brand points out that although a half-century cycle is slow in relation to replacing furniture or repainting a house, the rate of change in this layer is high in relation to, say, the need to rebuild a three-foot-thick stone wall in a castle. New technologies in thermal comfort, water conservation, and wireless communication are pushing many homeowners to rethink their mechanical systems. And of course the issue of sustainable energy will cause these systems to be improved further in the coming decades. Designing mechanical systems that fit within the skin and skeleton of a historic house can prove to be the most challenging part of a renovation or restoration project. . .
Anne Fairfax and Richard Sammons have designed some of the most elegant and critically acclaimed traditional houses in America during the past twenty years. Both studied at the University of Virginia, where they learned architectural history and were able to study the work of Thomas Jefferson and other American classical architects. 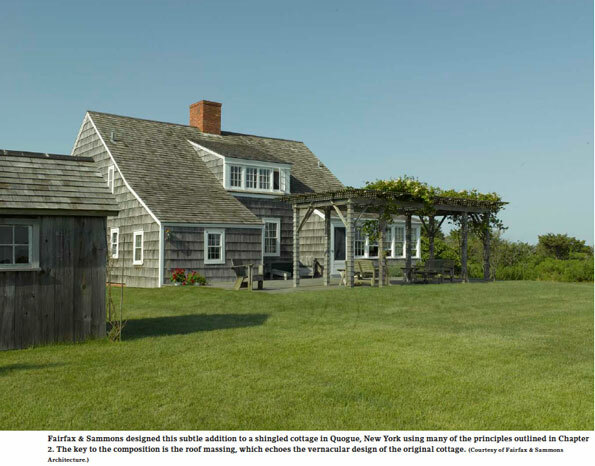 But after setting up practice in New York City, both were able to enrich their knowledge by direct experience with historic houses, such as one in Quogue, New York, on Long Island’s south shore—a Cape Cod cottage that had served as a modest fisherman’s house for most of its life. Its owners came to the firm in 2004 wanting an expansion that would not alter the rustic character of the building. Tired of cooking in a room the size of a closet and wiping their boots on the living room rug, they simply needed a new kitchen and mudroom. The simple mass of the shingled cottage was nearly perfect in itself, so the architects recognized that any large addition would ruin its prismatic lines. 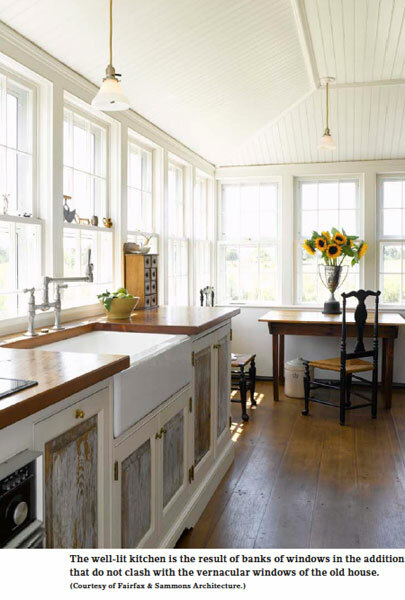 But the house was very dark (cozy in the summer but dusky in winter), and the kitchen provided an opportunity to offer a light, airy space as a tonic to some of the old rooms. The final design was based on formal patterns that a vernacular builder would have understood implicitly, but that few contemporary architects would have dared to build: a classic lean-to such as might have existed in seventeenth-century New England (where most early Long Islanders came from). By simply extending the steeply pitched roof on the seashore side to mimic an existing lean-to, and wrapping the porchlike volume around the side of the house, the architects were able to gain enough space for a comfortable, light-filled kitchen. By painting most of the interior white, they maximized the available light in the new areas. The exterior of the addition was treated as a bank of “ganged” double-hung windows with a single door to the exterior. While there is little question that this portion of the house is not part of the original, its similarity in size (modularity) and shape maintains continuity with the rest of the shingled volume. It has virtually no effect on the massing of the house from most angles. Two subtle but effective additional pieces rounded out the renovation: an upstairs box dormer and a square pergola on the seacoast side of the house. The dormer increases the apparent size of an upstairs bedroom considerably, while bringing in southeast light in the morning. The covered portion of an existing terrace appears to be a natural extension of the void in the house created by the two small projections on the south side. The architects placed it approximately twenty-five feet to the south in order to create a virtual courtyard for dining and entertaining in the evening hours. During the heat of the day, the table can be moved into a shady area under the pergola, which features wisteria and other climbing plants. Like many Long Island shore houses, this cottage lies on an exposed, windy plain with good beach views and privacy from neighbors. The architects enhanced its drama by leaving most of the site unplanted—underlining the imperative of their modest, elegant gestures. Sometimes a simple solution proves to be more effective than a complex one. When the assistant dean of Columbia’s respected historic preservation program came to Mark Alan Hewitt Architects with a “little project” to improve her Queen Anne house in Madison, New Jersey, we were somewhat intimidated. After all, she had just published the authoritative book on Queen Anne houses in America—what could we possibly design that would not mar the beauty of her late 1880s gem in the midst of a historic district known for its painted Victorians? The historic Goldsmith-Spencer house was on Maple Avenue, the heart of the district. Fortunately, we had designed similar additions for Victorian houses in recent years and had a few solutions to suggest that made minimal alterations to the house. The plan and room arrangements in this house were ubiquitous in late nineteenth-century pattern book plans. Our previous additions had utilized what we call “extruding” a portion of the main block of the house to gain additional space. We tried a very small bump-out that was met with little enthusiasm. When the client insisted that she wanted more space than first contemplated, we found a solution more in keeping with past successes. Why not extend the two-story volume of her existing house ten feet to the west? Extruding had several advantages over building a more discrete wing on the back of the house. Cost was a significant factor—the new foundation was minimal. The contractors were able to continue shingle and trim details that were on the old building without elaborate detail drawings. A half-timber pattern used on the front of the house could serve as inspiration for one on the back gable. Most important, rooms and circulation on both the first and second floors attached seamlessly to the new master bedroom and family room in the addition. The only drawback, unknown at the time of the schematic design, was that a foundation wall under the existing wing was built without mortar and would need reconstruction. After a few anxious days, the project was back on track, owing mainly to the skills of our Irish-born contractor. As the framing took shape, everyone was able to assess the quality of the new spaces in relation to the old. The client and her husband were immediately pleased with the views from the expansive master bedroom, but were surprised by some of the other advantages to the expansion on the first floor. As we noted in the Long House in the last chapter, spaces connected on axis (enfilade) borrow a sense of depth and scale from each other, appearing larger than their actual dimensions. This is the case with the family room in the house—the light from its wraparound windows and its connection with an existing formal dining room make the space seem vast and airy. Moreover, the couple realized that their clogged circulation patterns would be solved by the new loop around the existing kitchen and dining rooms. Perhaps most important, our new entry porch dealt with the three levels between the driveway, back yard, and first floor—access from auto to mudroom was vastly improved. In this project, simplicity was again critical to success. Following the patterns established by the original architect/builder, we were able to create an extension that is perfectly consistent with the language and form of the historic house. Room modules, roof shapes, historic details, and an intelligent site plan were the key. Was the addition too obviously a “copy” of the original house? The client didn’t think so. In order to give clues to future owners about the date of our work, we were careful to alter the details of the new rear porch to delineate the difference from the large front verandah. Recognizing that the work was exemplary, the local American Institute of Architects Design Jury gave this project a gold medal in 2009. Our client was pleased with both the award and her new family room. The Philadelphia Chapter of the AIA found the modest Radnor addition designed by Voith & Mactavish Architects impressive enough for an Honor Award, just one of many that the firm has garnered over twenty-plus years of practice. In this project they made the most of a relatively small addition, not only rationalizing an unsightly rear facade but also providing just enough additional space for a kitchen/ breakfast area. As a family house, the 1870 stucco residence provided plenty of space for bedrooms and living and dining rooms, but the “service” side was underdeveloped. Cooking in a small kitchen designed for Victorian servants was frustrating at best. “Our clients wanted to open the kitchen on both sides, build a family/breakfast room addition, and reinforce the connection to the rest of the house and garden,” says partner Cameron Mactavish. He notes that the house had a garden setting that was beautiful but not exploited to enhance the experience of viewing the exterior from the major rooms. When considering their addition the architects were intent on bringing the outdoors inside with big glass openings, but the style of the house did not permit window walls. Their solution was to study bay window designs common during the late nineteenth century and modify them to suit the twentieth. Another inspiration was the characteristic “jerkinhead” or “nun’s hat” roof on the existing house—a hip roof style that was popular during the late nineteenth century in English cottages and their American offspring. Sometimes repeating a quirky design motif can spoil the original, but in this case the one-story addition offered a smaller-scale version of the main roof, as if to suggest a generational lineage. . .